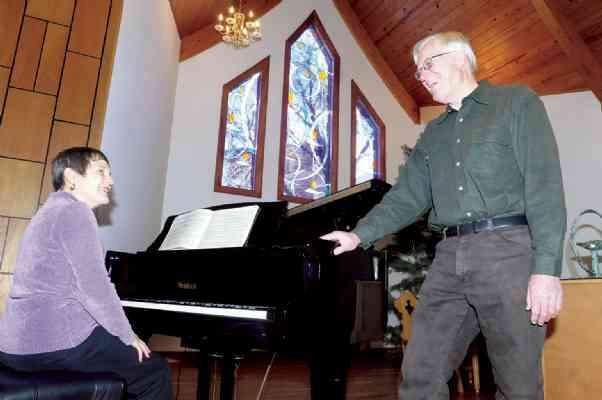 Marilyn Garst rehearses her part for a recital of piano duets to be held Jan. 16 at the Unitarian Universalist Fellowship of Durango while her husband, Ron Garst, the fellowship's president, listens. The stained glass windows in the background were recently installed in the sanctuary. Two years into owning its own church, the Unitarian Universalist Fellowship of Durango is making the building its own. The fellowship purchased the complex in 2005 from the Church of the Nazarene. This fall, the fellowship installed in its sanctuary new stained glass and etched glass windows that were created by Betty Kilpatrick. "We had an artistic committee to work with her," fellowship President Ron Garst said. "We were thinking we wanted a circular window. But they just told her where it would go and that we wanted it to include the flaming chalice, which is our symbol." Fellowship members are delighted with Kilpatrick's final result, a triptych of windows, which echoes the ceiling line. The design features flaming chalices in a variety of sizes in tones of purple, green and gold with a sense of swirling ribbons and movement. Kilpatrick was a guest at the inauguration of the windows. "During the first service after they were installed, we recognized her," Garst said. "People were taking photos of her with the windows." Because Unitarians respect all religions and individuals' quests for spiritual meaning and religious development, the etched glass windows reflect the fellowship's ecumenical spirit. Kilpatrick incorporated the Christian cross, Jewish Star of David, Muslim star and crescent, Buddhist wheel, Hindu Om, Taoism's yin/yang, Native American Zia sun and the pagan goddess for Earth-centered religions. The building also has gotten some new stonework on the outside. Plans are in progress for some significant landscaping, including a covered gathering area featuring peace poles with sails, a memorial/meditation area enclosed by a stone wall and a children's playground. The building has also allowed the fellowship to add to the community's music scene. Marilyn Garst, a retired professor of piano, harpsichord and keyboard ensembles from George Washington University in Washington, D.C., serves as the fellowship's musical director. She has created a classical music recital series that uses the fellowship's new grand piano and the sanctuary's acoustics. On Jan. 16, she will perform duets with Fort Lewis College associate professor of piano Lisa Campi, including pieces from Ravel, Mozart and Barber, an American composer from the 20th century. "Ravel's 'Ma Mere l'oye' (Mother Goose) is based on children's fairy tales," she said. "Ravel stated that his intention of conjuring up the poetry of childhood led him to simplify his style. He later orchestrated the pieces for a ballet." The Unitarian Universalist Fellowship of Durango meets at 10 a.m. Sundays at 419 San Juan Drive, southwest of Needham Elementary School. Presentations in January will include "Reinhold Niebuhr Preaches to the New President" by Brooks Taylor on Sunday; "The Work That Reconnects" by Sandy Bielenberg on Jan. 11; "The Quaker Tradition of Pacifism" by Tracy Davis and Ross Worley on Jan. 18; and "In Memoriam" by Katherine Burgess on Jan. 25. Two recitals remain in the 2008-09 series. At 7 p.m. Jan. 16, Marilyn Garst and Lisa Campi will perform piano duets by Mozart, Schubert, Ravel and Barber. Admission is $12/adults, $6/students and children under 12. At 7 p.m. May 1, Louis Steele will play the guitar.